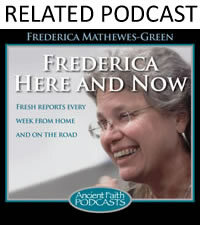 Acclaimed author Frederica Mathewes-Green takes us through a typical Divine Liturgy in her little parish of Holy Cross in Baltimore, setting of her well-loved book Facing East; Interspersed with reflections on the liturgy and the Orthodox faith are accounts of adventures around the country. In all the places she visits and all the people she meets, Frederica finds insights about faith, American life, and what it means to be human, and she shares these insights with the wit, pathos, and folksy friendliness that have made her one of the most beloved spiritual writers in America. Available in paperback ($16.95) and audio book ($19.95).